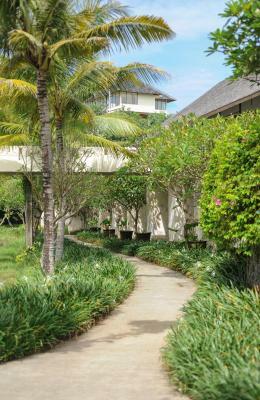 Lock in a great price for Komaneka at Keramas Beach – rated 9.2 by recent guests! The breakfast is great. 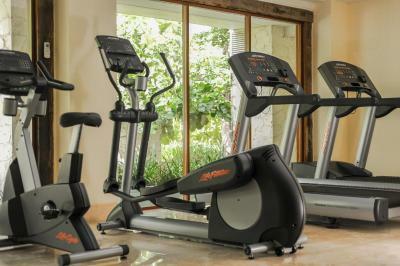 Everyday changes and you have many options to choose. The service is very good and has very good vibes. Wherever you want to go they include the transport as they know it is not in the center. You have someone who is always available to help you and they are super happy to do it. All they really want to make your stay as easy and comfortable as possible. Beautiful, stunning setting looking right onto the Indian Oceon from our private villa, which had an enormous, infinity plunge pool, lovely outdoor seating/lounge area, a sala, then a huge, beautifully appointed air conditioned bedroom with seating, large desk/table, behind that a dressing area, bath, shower; also outdoor shower. The staff are amazing, warm, helpful, well trained, delightful - we needed block out so they arranged to go out and buy some in for us. You can have any of the restaurant meals in your room, including the fabulous, 3 course breakfast, which changes everyday. The restaurant staff produced perfect coffees to order, every day. 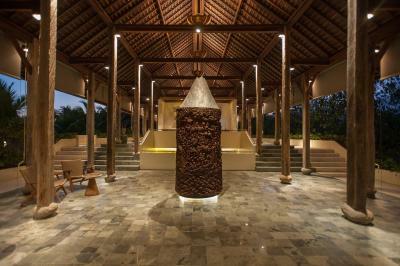 The resort is on a large scale, but feels intimate. 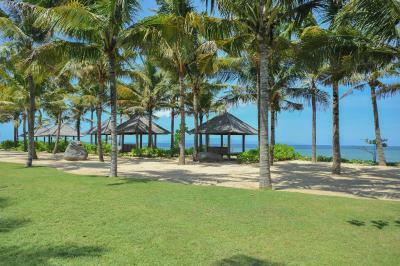 Keramas Beach is in a quiet part of Bali, known for its surf beaches. So the usual hussle of Bali is absent. Great for a total wind down and relax. I had a facial, manipedi and massages - all wonderful - at their lovely spa. Right at the lava black Keramas beach, litterally in the middle of rice fields; very good restaurant using fresh local ingredients; large pool (40m) im garden as part of general facilities; villas also have their own pool; excellent breakfast; lovely staff; owned by balinese people, run by balinese people. Nice villas with a large pool overlooking the Indian Ocean. They provide as many water bottles as you wish free of charge. The accomodation is luxurious, has amazing views, restaurant is delight to eat at and the staff are very attentive and friendly. 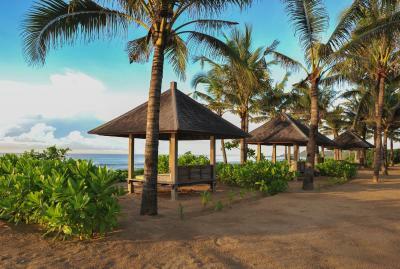 This is the perfect place to relax and have an amazing holiday in Bali. 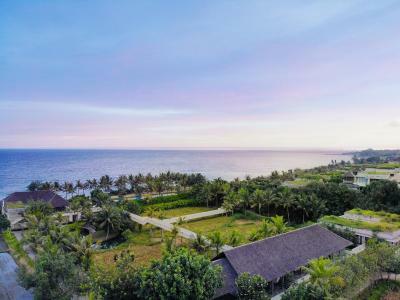 Komaneka at Keramas Beach This rating is a reflection of how the property compares to the industry standard when it comes to price, facilities and services available. It's based on a self-evaluation by the property. Use this rating to help choose your stay! 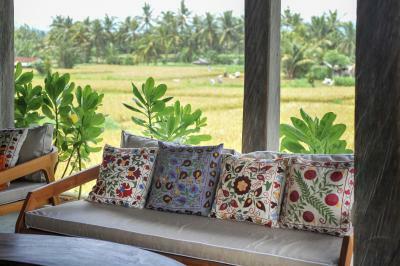 One of our top picks in Keramas.Komaneka at Keramas Beach offers panoramic views of rice paddy fields, Indian Ocean and Mount Agung. 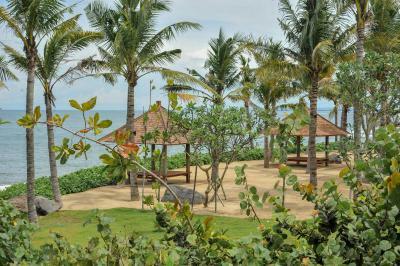 The beachfront property features an open-air restaurant, a beachside swimming pool and free WiFi. 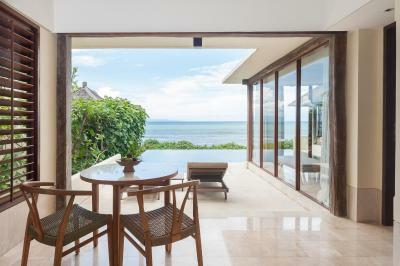 Boasting contemporary Balinese architecture, the spacious air-conditioned villa has a flat-screen satellite TV, a private pool and a terrace. The private bathroom comes with a hairdryer, free toiletries and a separate bath and shower. Timur Kitchen serves Indonesian and international cuisine from local ingredients. 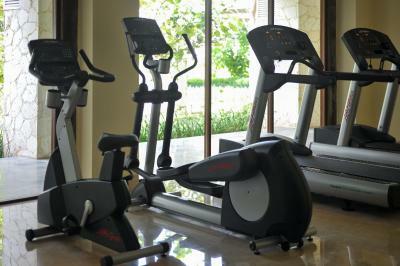 Guests can exercise at the fitness center and experience relaxing treatments at the spa. The property can arrange a baby sitting service and airport shuttle for an extra charge. Daily housekeeping is provided for free. 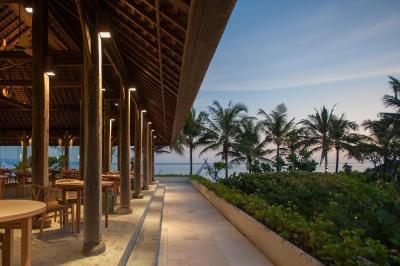 There is 24-hour front-desk at Komaneka at Keramas Beach. 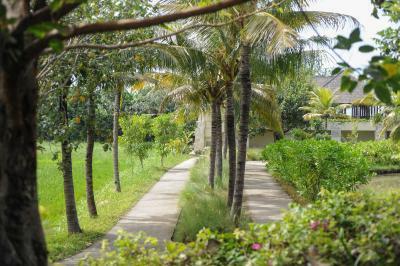 Sanur is a 15-minutes drive from the property, while Ubud is 30-minutes away. 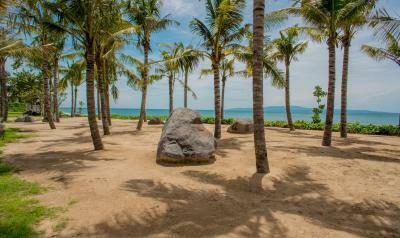 The property is a one-hour drive away from Ngurah Rai International Airport. This property is also rated for the best value in Keramas! Guests are getting more for their money when compared to other properties in this city. 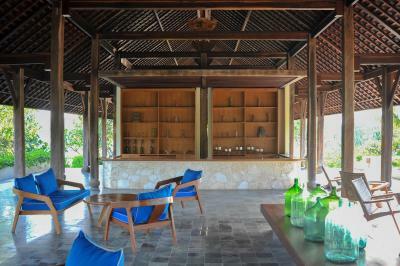 When would you like to stay at Komaneka at Keramas Beach? 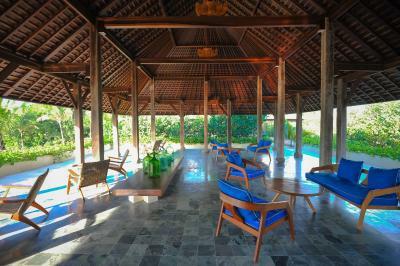 This spacious air-conditioned villa features a flat-screen satellite TV, a private pool and a dining area. 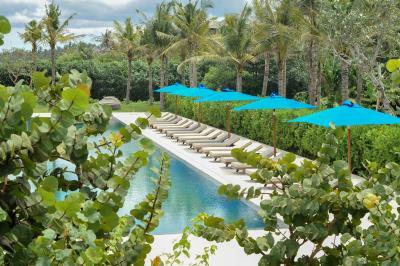 Guests enjoy ocean and pool views. 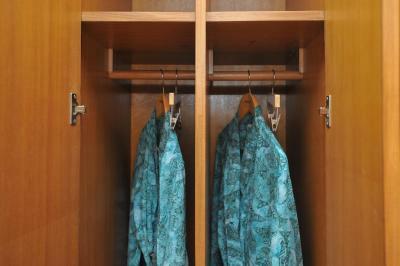 The private bathroom comes with a separate bath and shower, bathrobes and free toiletries. This villa features a tile/marble floor, view and electric kettle. House Rules Komaneka at Keramas Beach takes special requests – add in the next step! 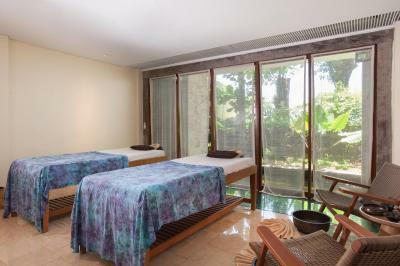 Any additional older children or adults are charged IDR 900000 per night for extra beds. Komaneka at Keramas Beach accepts these cards and reserves the right to temporarily hold an amount prior to arrival. Upon check-in, customers are required to present the confirmation page, and the credit card used to pay for the booking. The credit card presented upon check-in is required to go through verification procedure for security reasons. The holder of the credit card used to pay for the booking should be part of the traveling party. If you are making payment using another cardholder's credit card, kindly contact the hotel as soon as possible for further payment instructions to avoid any inconvenience during check-in. Please inform Komaneka at Keramas Beach of your expected arrival time in advance. You can use the Special Requests box when booking, or contact the property directly using the contact details in your confirmation. Limited food options: We are Komaneka devotees, having stayed at properties run by this local family, in Ubud. 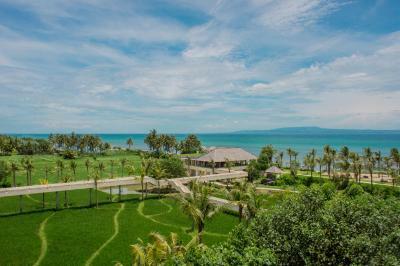 Keramas is their brand new beach villa style resort, with some of the villas still to be completed. While the restaurant and room service was excellent, the choice was a bit limited for a longer stay - we were there for 7 days. The menu is Indonesian/western fusion, but some of the meals were disappointing - especially the shellfish - we had the king prawns and a lobster pasta, both of which were overcooked. We expected shellfish - prawns, lobster - to feature on the menu, as it is right on the sea, but this is not the case. The Indonesian soups and duck though were fabulous. There is only the one restaurant. 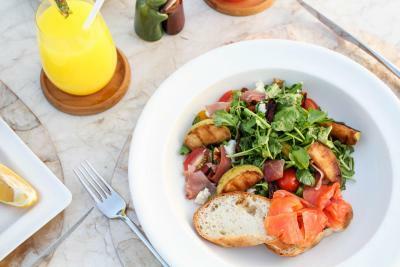 We think a more casual dining option should be included as it is a resort style hotel- with lighter meals, snacks etc For light meals there were soups and sate and french fries [which were not crispy]. The tariff includes an afternoon tea, which we didn't try due to the heat of the day. The resort also needs to work on its wine list and ensure that they have a good range available, especially as there are no local shops anywhere nearby who sell wine. The hotel got some in when we raised this, but it was awkward having to do that. Unfortunately, in Indonesia, the Two Island wine brand prevails, and Hatten, both local wines and pretty rough to the Australian palate. The cocktails however were fab. There are no other 'safe' restaurants to go to nearby , other than Warung Legong, which is great, and whose owner, Kadek, will come and collect you and drop you back after dinner. Only thing I didn't like was the fact we had to leave, all was perfect. Can't swim in the ocean because of the sea condition. Also there are no beach chairs on the seaside. Food options in the restaurant of the hotel could include more international options. I can't say anything bad about this place because there isn't any. We didn't want to leave. We would like to buy Villa #7 and stay there to live! Thank you Komaneka for an incredible stay! WOW....WOW...WOW..The Komaneka at Keramas Beach is one of the best (if not the best) place we have ever stayed in. Everything is perfection. 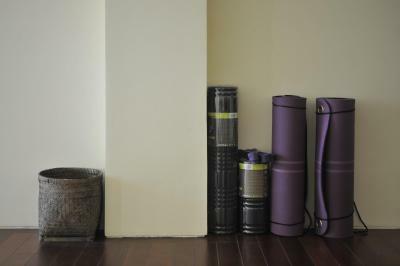 From the moment you arrive, you are greeted with an aromatherapy towel and drink. 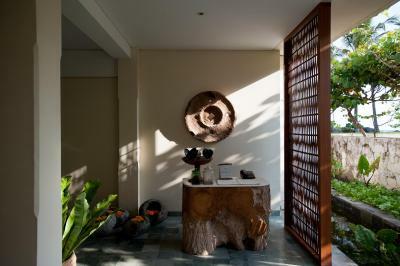 The open atmosphere of the lobby is beautiful and relaxing. We were greeted by Ardik who took great care of us. Toured us around the property and then took us to our oceanfront villa. The oceanfront villa is better than we expected (the whole property is)!! 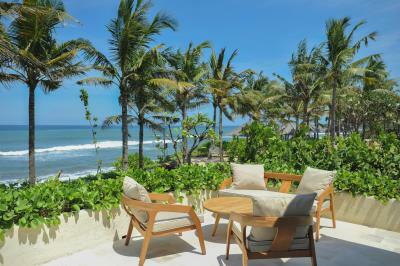 The villa overlooks the ocean with unobstructed views of the beautiful soft black sand beach. 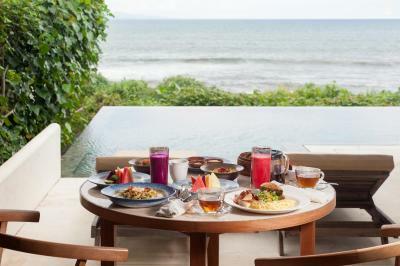 Every morning we saw surfers as we enjoyed our delicious Balinese french press coffee. You had the option to have your meal in your villa or at the restaurant-or anywhere you want. 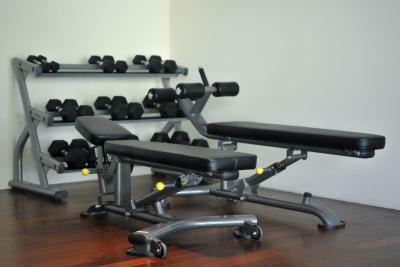 This place will accommodate your every need! They truly care...their service and attentiveness shows it! The staff at the restaurant, including Rudi, was marvelous and such a pleasure. They were kind and always asking about our day. The breakfast is INCREDIBLE!!! WOW!!! I got used to that! The fresh daily juices were delicious- don't forget to try the banana juice. The whole property felt like it was ours! 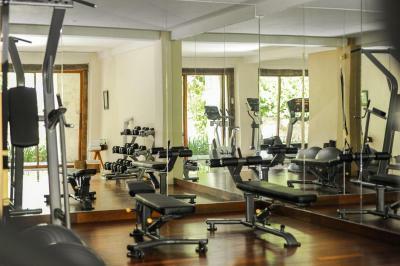 Many people choose to stay in their villas, since you have your own beautiful, clean pool with a view. Other guests do lay by the main pool or in the cabanas. We tried both and absolutely loved both! The added amenities such as the water to wash sand off our feet was also a great touch! The fruit bowl in the villa is replenished daily and so is the bottled water. I can't forget the Nespresso machine in the villa, so nice to have my favorite coffee! There is an Apple TV in the villa which was great as we screened our shows off the phone. The incredible gifts we received to take home with us truly touched us. So beautiful. The beach is directly on the property and we loved the beach!! Clean and gorgeous sunset and sunrise! Very romantic property and highly recommend. We will be back to see our home away from home! 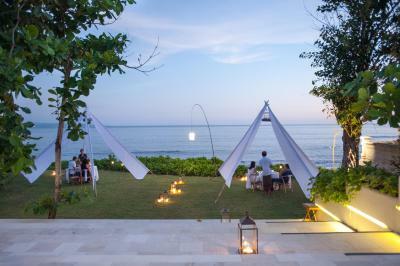 It’s about an hour from Airport and busy Jimbaran and Seminyak- so travel to and from the hotel can be expensive unless you have pre-arranged transportation. I also would have preferred that the pool to be lit as it was difficult to go for late night swim. Also there’s not many restaurants around this area and I found Timur Kitchen ( hotels onsite restaurant) to be very expensive. It was an amazing quiet retreat. The black sand beach was impeccable. It was clean and almost seemed it was a private beach as there wasn’t anyone around. The hotel is new and the rooms were amazing exactly as seen in pictures. The staff were also very good to us. They did everything to ensure our stay was perfect. 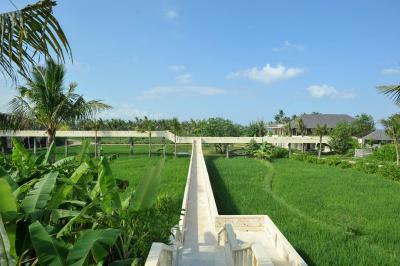 Including organising an itinerary for the days we were staying there do we could see as much of Bali as possible. I can not thank them enough. Thoroughly enjoyed my stay.